If you can't find a favorite hometown food in New York City, do you a) return home as often as possible to eat it, b) learn to cook, or c) open a restaurant and start serving that hometown food to all New Yorkers? Fortunately for New York, hungry entrepreneurs have been answering "C" for centuries now. In the case of Justin Palmer of the Hideaway, first came the bar and restaurant, then came the bluefin crabs. Unable to find a place dedicated to serving hardshell crabs from Maryland or his native Virginia, he contacted his longtime crab supplier and started flying bushels of bluefins up every weekend. Now the Hideaway, a bar and restaurant started by four friends who wanted their own "clubhouse" in Tribeca, has become a mecca for transplanted crab lovers from up and down the Eastern seaboard. If you don't know from crabs, you may think a restaurant like City Crab is enough. It's not. A real crab shack doesn't have newfangled things like sushi on the menu, nor should it dabble in crabs from here, there, and everywhere. As for places that specialize in Cajun food, do what you will with crawfish, but the words "crab" and "boil" should never appear next to each other. In a real crab shack, the tables are covered in paper, the paper's covered in steamed bluefin crabs, the crabs are covered in Old Bay, and the diners are covered in crab. It's seafood gluttony at its finest. Do not be afraid if you don't know how to tackle this crustacean. The Hideaway makes it easy, providing instructions for how to eat a crab on their menu, and chances are the diners at the next table would be more than happy to help out with tips. I would say you burn nearly as many calories opening them as you do consuming them, but we were served at least 15 crabs on our order of a dozen. 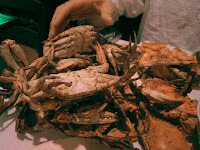 The generosity didn't stop there: the crabs were caked in Old Bay and steamed just right, even though the chef was working with a more difficult pot-on-the-stove system rather than the steamers dedicated to crabs that you see further south. 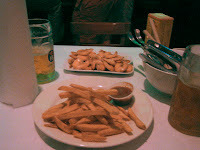 We also tried the shrimp and the fries, but both of these paled next to the succulent crabs. Non-seafood fans can opt for the hefty burger, which has been a draw at the Hideaway even before the crabs came. Though Blue Crab Mondays have brought the Hideaway into the limelight, the place still retains its clubhouse feel. Led Zeppelin plays on the stereo, major league baseball plays on the TV, and the walls are decked with slick photographs of a young Mick Jagger, Jimi Hendrix, and Carolina basketball stars. (Several of the owners attended Duke.) 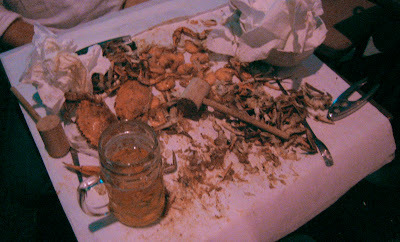 When all the crabs were gone and the waitress had swept up the shell debris from under the tables, the chef, staff, and owners got together and did a shot behind the bar. Now this is the kind of place anybody could call home. 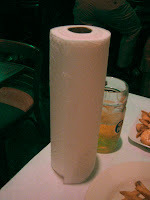 1) Make sure you have the necessary accoutrements: a mallet, paper towels, and beer. 2) Remove the claws and legs. 3) Pull off the pointy underside piece, the "apron." 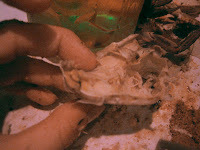 4) Slide your thumb in the opening between the crab body and top shell. Pull off the shell. 5) Tear off the spongy "lungs," scoop out the "mustard" (the gunk in the cavity), and discard all. 6) Crack the crab body in half with your hands. 7) Pry away any of the overlying thin shell and dig into the body to extract the crab meat, then fan each half apart to get at the inner cavities. 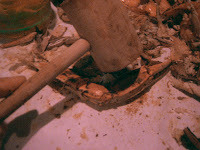 8) Use the mallet on the claws only, tapping hard enough on the upper part of the claw to break it but not so hard as to pulverize the meat underneath. 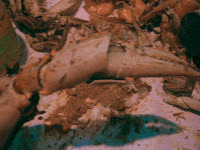 9) Save the fiddly legs for the end of the crab feast and deal with them only if you are still hungry. hi, i would first like to thank gastro chic and secondly apologize for anyone who came for maryland blue crabs after 7pm tonight. 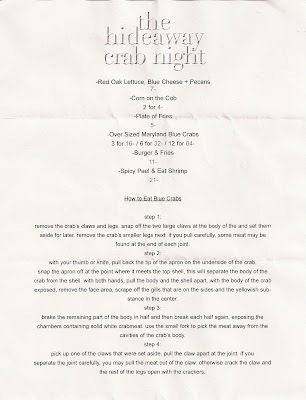 the hideaway has received an overwhelming responsed to it's blue crab night. we were unable to accomodate everyone's needs tonight. 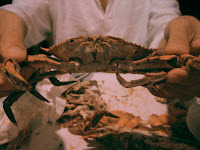 thus, we will serve blue crabs on wednesday! our blue crabber himself was not happy about being awaken this night . but we are truely trying our best to make everyone happy. sincere apologies to anyone from gastro chic that showed up and did not get crabs tonight. We went to get crabs last night and they weren't serving any food at all. I'm curious to know what happened. I was so disappointed.